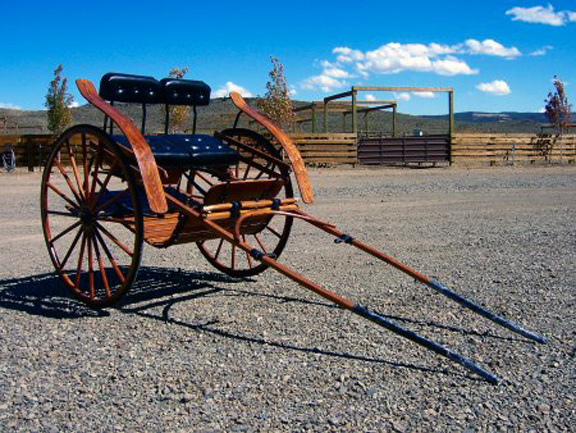 Reproduction Horse Drawn Mud Wagon made to scale on a antique Henderson Gear. Could be pulled by quarter horse size horses. Comes with antique style manual brake, new wheels, team pole, lamps (not pictured). 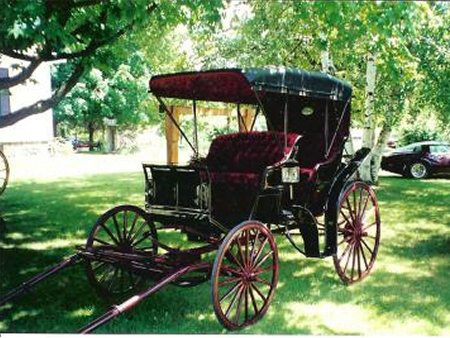 Reproduction of an early 1880's Wells Fargo Stagecoach as built by Abbott & Downing. 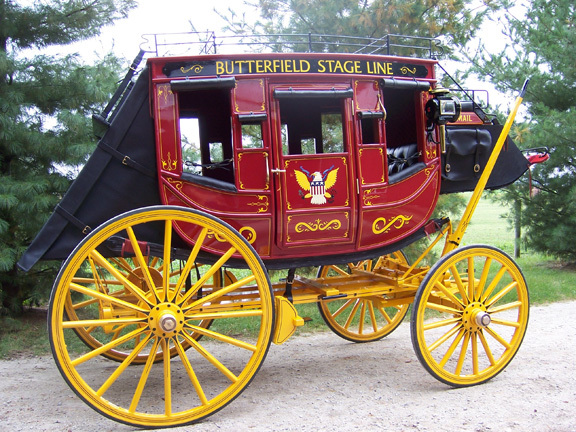 We took measurements for this Wells Fargo Overland Butterfield Stagecoach from the one at the Chicago Museum of Science and Industry. Components of the running gear assembled from Amish shops in Indiana and Ohio. The Concord coach is full scale, seating up to 16 or so--inside with the driver and on the upper rear. Leather or simulated leather seats and movable bench inside; fabric-finished walls and headliner. 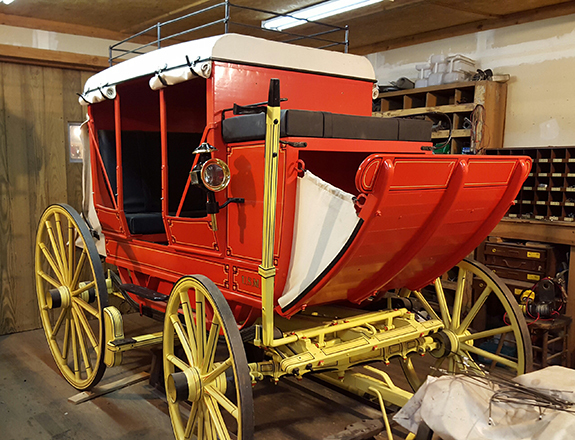 The stagecoach is an exact replica with three exceptions: We've added hydraulic brakes along with the manual brakes (as required by most insurance companies for passenger services), channel and rubber edging on wheels, and roller-bearing axles (historically correct exterior). Steel-rimmed wheels available on request. Decorative scrollwork on request. Complete with extensive leather (10 hides) on the boot, window rolls, driver's seat boot and heavy thorough brace suspension system. This coach rolls gently as it moves. Comes with pole for use with two or four horses. If you do not need a particular feature, we will deduct it from the price. Covers are also available for purchase. The following describes our standard horse size two seated Buckboard; draft horse and pony size buckboards are also available. Buckboards are a normal stocking item for us. 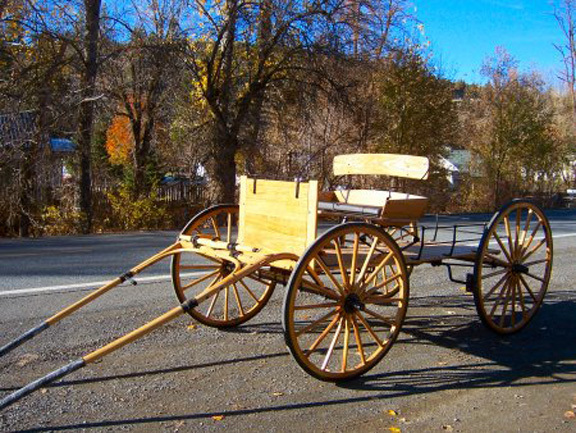 The Buckboard comes hardwood-built body including the single horse shaves, and it can be finished with a clear coat or stained and clear coated in our western finish or stain of your choice. Slated floor, wooden dash that includes a black metal rein rail and whip socket. Our buckboards feature: Vinyl upholstered seat with back rests, iron trim arm rests, passenger body entry steps, heavy duty short turn fifth wheel, seat suspension consists of two elliptical leaf springs 1-1/2" wide by 24" long. Brake system is the antique style rear wheel rub break. Heels: Wood wheels are finished with 1.5"
Solid rubber tire, roller bearing hubs. New Sheep Camp Wagon, ready for your trail camp or backyard guest house. Wagon comes with new wheels, team pole. It is totally new and built to scale. Standard 38" x 10'6" box and seat. Options: Antique style wheel rub brake, hydraulic brakes, bows, canvas and chuck box, wood wheel finished in rubber. 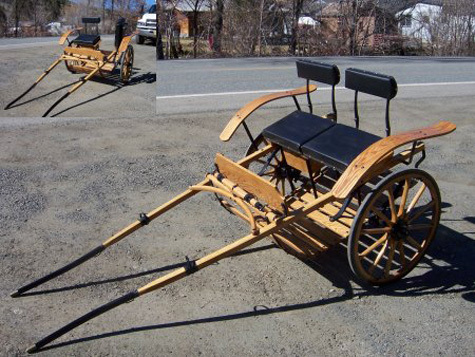 The following describes our standard horse size single seated Buckboard; draft horse and pony sizes are also available. 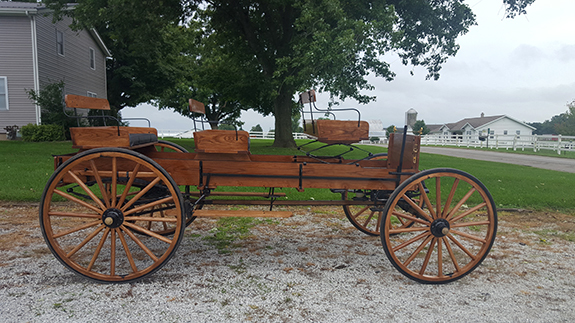 The Buckboard comes hardwood-built body, including the single horse shaves, stained a color of your choice and clear coated or stained and clear coated in our darker stained finish. Slatted floor, wooden dash, that includes a black metal rein rail and whip socket. 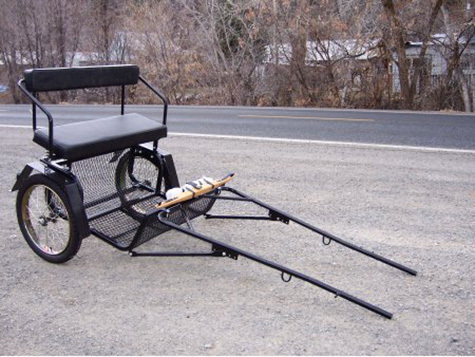 Features: Vinyl upholstered seat with back rest, iron trim arm rests passenger body entry steps, heavy duty short turn fifth wheel, seat suspension consists of two elliptical leaf springs 1-1/2" wide by 24" long. Brake system is the antique style rear wheel rub break. Axles: 1-1/8" roller bearing style. 1-1/2" solid rubber tire, roller bearing hubs. Standard 38" x 10'6" box and seat. Box and seat built with poplar lumber. Gear and tongue built with Ash lumber. Hardwood-built body, tongue & groove floor, removable tailgate, wood dash. Measures 88" long, 40" wide. Sides are 10" high with sloping drop from seat to dash. Features: Wood seats with iron trim and backrest, roller bearing type axles: heavy duty, short-turn fifth wheel, three elliptical leaf springs (one in front is 5-leaf: two in rear are each 4-leaf). Old time manual brakes included: hydraulic brakes optional. Wood wheels are finished with 1.5" solid rubber rim (steel available upon request). Wheels measure 38" front, 42" rear. 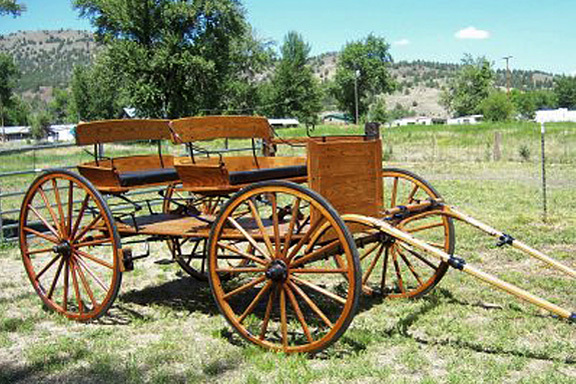 Our ranch wagons are popular for ranch or farm use, providing a comfortable ride. Also available to specified color. Finished out with black iron and brass trim. 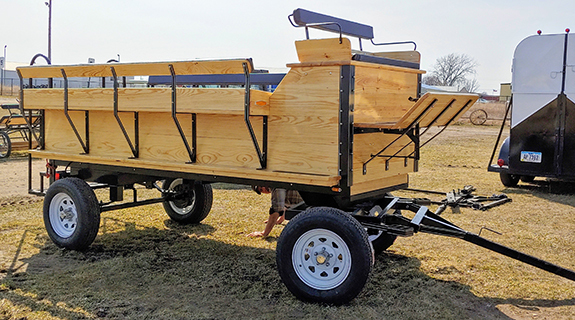 Hardwood-built body, tongue & groove floor, hinged tailgate, wood dash. Measures 880" long, 40" wide. Sides are 10" high with sloping drop from seat to dash. 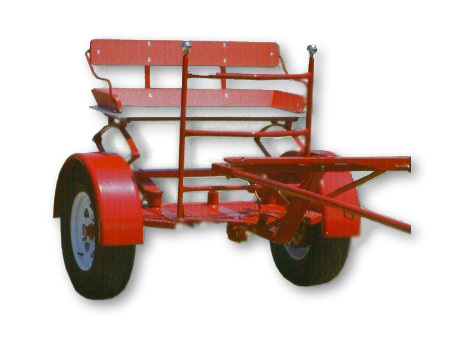 Features: Wood seat with iron trim and backrest, roller bearing type axles: heavy duty, short-turn fifth wheel, three elliptical leaf springs (one in front is 5-leaf: two in rear are each 4-leaf). Old time manual brakes included: hydraulic brakes optional. Wood wheels are finished with 1.5" solid rubber rim (steel available upon request). Wheels measure 38" front, 42" rear. 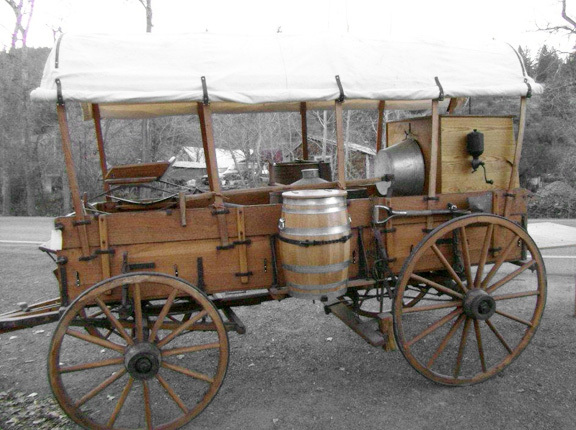 Chuckwagon ready for your wagon trip. Comes with antique style manual brake, rubber on wheels, team pole, roller bearing hubs, chuck box, canvas, bows and seat. 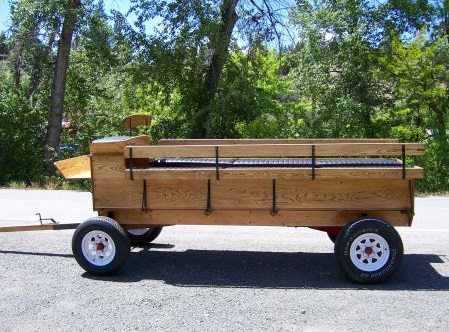 An example of one of our custom Chuck Wagons. Prices vary according to choice of wagon and materials. Measurements: Varies to your needs. 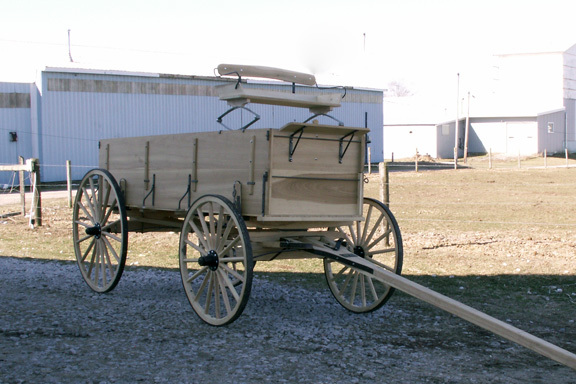 Chuckwagons can be made new like this one pictured or made up from a used standard box wagon that we stock. Draft size horse or light size team. 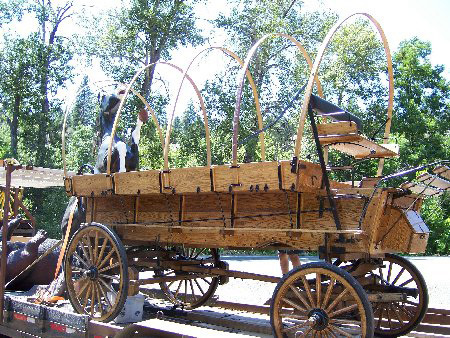 New, the chuck wagon comes with hardwood-built body. It has tongue and groove floor, hinged tailgate, and wooden dash. 38" x 10'6" box, stained with manual brake, chuck box, bows. Seat with back rest and roller bearing wheels, finished in rubber or steel tires. Options: Wooden hubs, Canvas, Hydraulic Brakes, Paint instead of stain. Measures: Varies to your needs. 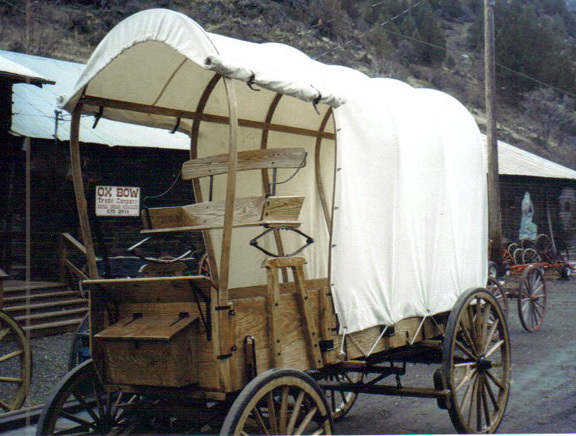 PRICE: Chuck Wagon with bows $7,750.00. Draft size horse or light size team. 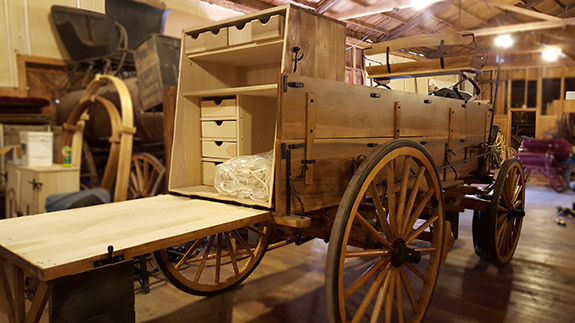 New the chuck wagon comes with hardwood-built body. It has tongue and groove floor, hinged tailgate, and wooden dash. Features: Wood seats with iron trim and back rests, roller bearing type axles; heavy duty, short-turn fifth wheel, three spring gear. Old time manual brakes included. Wood wheels are finished with solid rubber rim (steel tire available upon request). Extras that are also included are the chuck box which has a hinged door with enclosed drawers and shelves the canvas and bows, and the water barrel. Wagon Price: depends on what extras you are wanting or needing. This one just sold, but you can build one to your liking if you want more of a western look. Comes with hydraulic brakes, team pole. Carriage lamps are not included, but available. Wood construction, steel-reinforced for strength and durability. Cut under design for ease and safety in turning. Roller bearing axles; front and rear elliptical springs. 40" seat; tuft & button upholstery. Fold-down auto top with rear window. Standard colors: black box with either dark green or burgundy running gear. Upholstery & headliner to compliment gear. Gold pin-striping on body and wheels. Options: Pole with neck yoke, hydraulic brakes, carriage lamps & brackets. Custom paint and upholstery upon request. Top Buggy with matching shaves. Matching Pole with neck yoke extra. 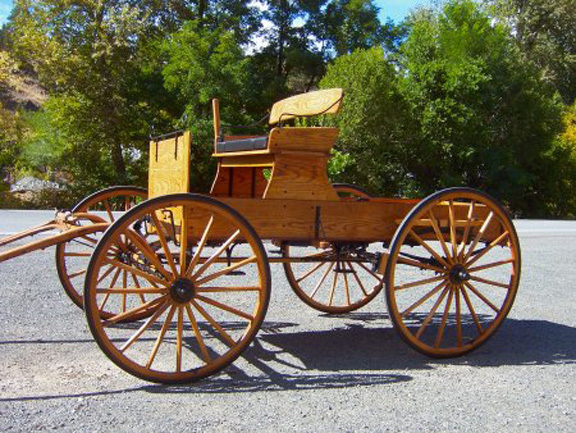 PRICE: Horse Drawn Doctors Buggy $4,250.00. Wood construction with steel reinforcement for strength and durability. Roller bearing axles; cut under design for better turning and safety. Folding auto top with rear window; seats elegantly upholstered in tuft and button design. Standard body colors are white or black with burgundy crushed velvet upholstery and headliner. 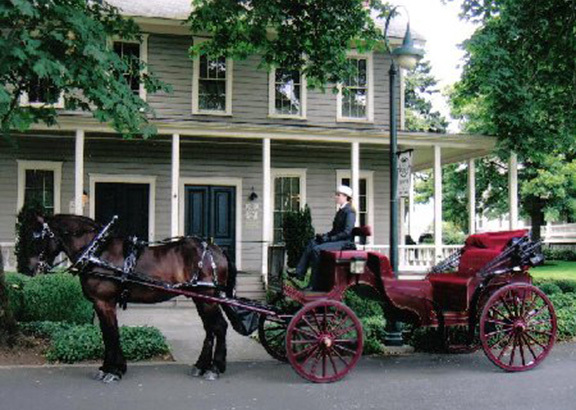 We have a Horse Drawn Victoria Carriages in any color that you desire. Special paint or fabric upon request. Decoratively pin-stripped in gold. 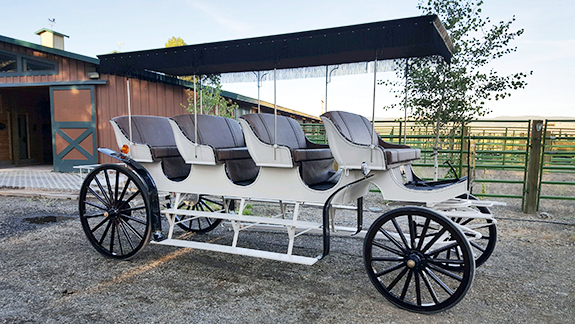 We offer the Victoria Horse Drawn Carriage in either standard horse size, suitable for one larger horse or team, or in a 7/8 scale version suitable for either large ponies or smaller horses, singly, or in teams. Victoria with matching shaves, storage trunk, full fifth wheel, double spring front suspension, hydraulic brakes. Matching Pole with Neck Yoke: $590.00. Available in 7/8 scale or full six passenger size. The 7/8 size is excellent for use with large ponies or small horses, either singly or as a team. Wood constructed body, reinforced with steel, cut under design for ease and safety in turning. Seven-eighths model is 6'6" in length and 63" at it's widest point, outside fenders. Elliptical leaf springs, one in front and two in rear. Patented dash and fenders. Seats are 34" wide, tuft and button upholstery on passenger seats; leather like fabric on drivers seat. Headliner in folding auto top matches seat upholstery. Rear oval window. Wood wheels are finished in channel and rubber; 30" diameter in front and 38" in rear. Our standard colors are black body with either forest green or burgundy running gear, upholstery and headliner. Other colors upon request. Decoratively pinstriped in gold. Rear storage trunk with brass trim; hydraulic brakes are standard features on both sizes. 7/8 scale vis-a-vis with matching shaves. Six place Vis-a-Vis with matching shaves. Includes full fifth wheel suspension system, hydraulic brakes, wiring and lights system, 46" seats, driver's seat backrest and storage trunk. Available in 7/8 scale and full six passenger surreys. Both have wood body construction, steel-reinforced 1" roller bearing axles, wood wheels with channel and rubber: folding leather-like auto top with rear oval window; headliner matches the cloth upholstery. In stock surreys have forest green or burgundy running gears with matching tuft & button upholster; black body. Custom paint upon request. Fringed top in lieu of auto top also available. Completed vehicles with shaves or pole are pin-striped in gold. A matching rear storage trunk with brass trim is standard on both surreys, and the six passenger vehicle is equipped with hydraulic brakes. 7/8 scale surrey with matching shaves: Call for pricing. Matching pole with neck yoke: $590 (for use with large ponies or small horses: 36" wide seats). 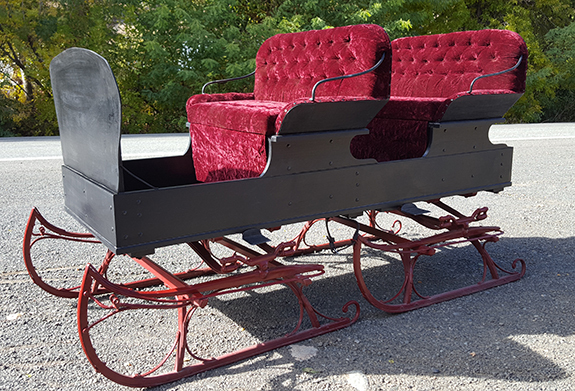 Six passenger surrey with matching shaves: Length 10' Width 6' Height with the top up is 7' and seat cushion width is 42'. Matching pole with neck yoke: $590 for standard horse size. Complete wiring package for either vehicle, installed: $395. Turn signals, rear brake lights, flashers. Carriage lamps are not included. This vehicle is similar to our standard surrey, but with an additional passenger seat. Surreys can be built two, three or four seaters. They all have the same heavy duty wood body with steel frame, cut-under design for ease and safety in turning. Wheels are finished in channel and rubber, measuring 3/4" diameter in front and 44" in rear. Seats measure 46" across. The fringed top is constructed of a leather-look material, top-stitched, with four-inch matching fringe. Mounted on six iron poles, painted. Headliner on fringed top matches tuft & button upholstery. Has patent dash and fenders. Shaves (pin-striped and matching the surrey) are included in the base price. The three-seated surrey comes equipped with hydraulic brakes and a matching rear storage trunk with brass trim. Brass hubs are another option. 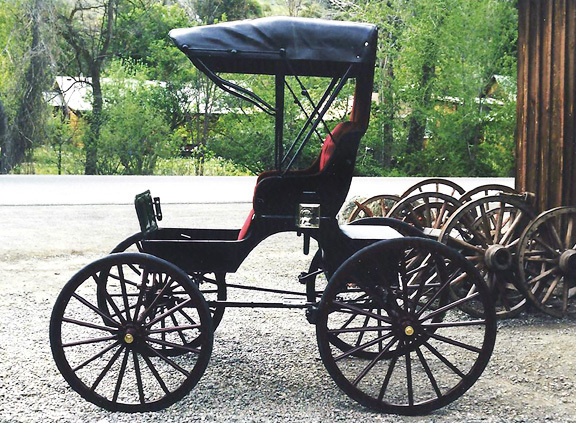 Three-Seated Fringe-Topped Surrey: includes shaves, hydraulic brakes, rear trunk. Matching pole and neck yoke $590.00 painted. ELLIPTICAL SPRINGS are carriage springs made up of sets of over-lapping steel plates hinged together. 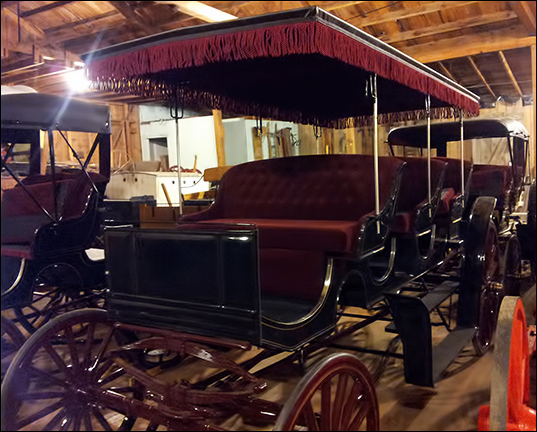 Invented by Obadiah Elliott of England, in 1804, the springs revolutionized carriage building for the first time, allowing construction without using heavy wooden or iron bars to connect and brace front and rear axles. Standard body colors are white or black with burgundy crushed velvet upholstery and headliner. 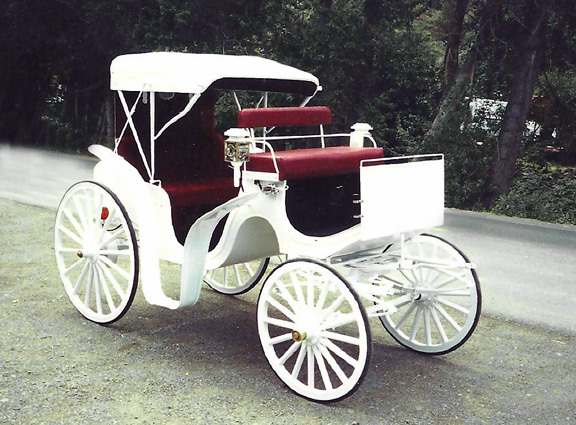 Order a Horse Drawn Victoria Carriage in any color that you desire. 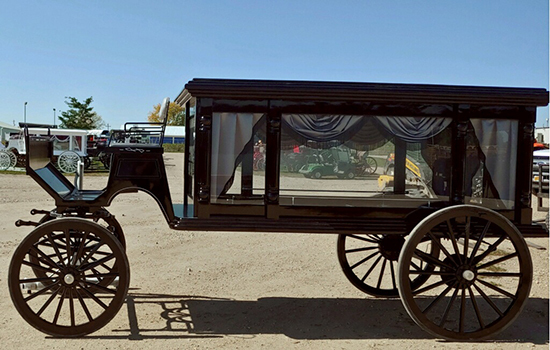 This horse drawn hearse is painted with an acrylic black enamel paint. It can be painted black or white or any color of your choice. The curtains can be the same color as the hearse or a color or your choice. Two Seat Bobsled with front and rear bobs for easy steering. Black upholstery and maroon body. Three Seat Bob Sled with two bobs for easy steering, red cushions, team pole. Back two seats are removable, so the rear of box can be used for hauling, etc. Bobsled comes wth team pole. 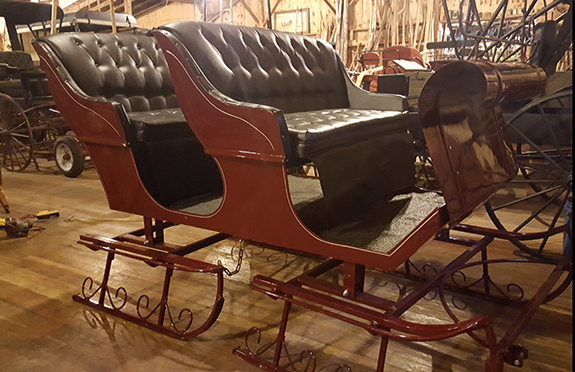 Sleigh comes with single horse shaves and ready for a Christmas display in your home, business, or ready to hitch to your horse for a sleigh ride! 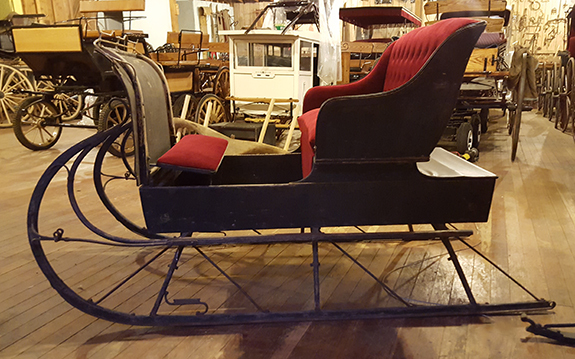 One Horse Cutter Sleigh with new upholstery and single horse shaves. 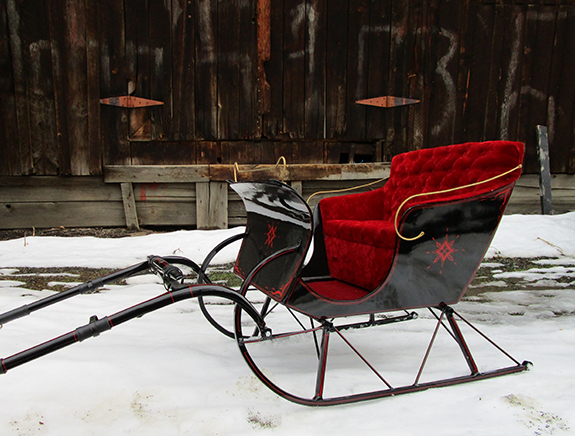 Child's Sleigh with shaves to be pulled by a goat or mini horse. 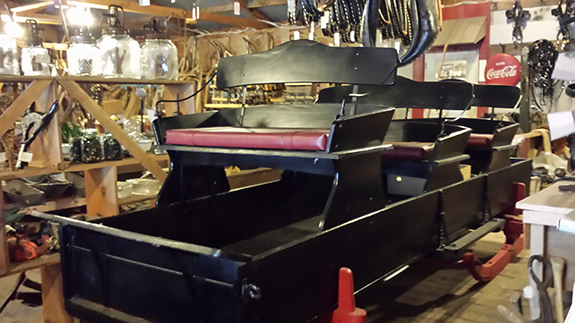 Horse Drawn Wagonette with rubber tire gear. Comes with hydraulic brakes, shaves and wood wheels. 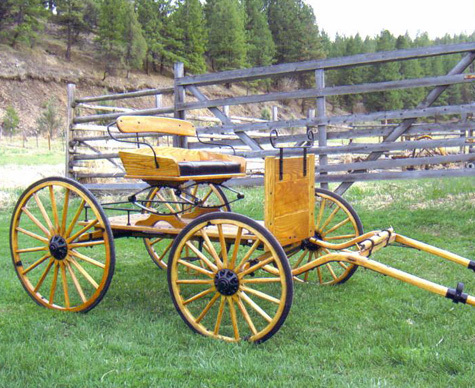 Horse Drawn Wagonette with wooden wheel gear. This wagonette body is unique, and saves you money. It is built to fit on bobsled gear for winter use and rubber tire gear the rest of the time. You only have to change out 4 bolts and move wagonette body to interchange from bobsled to rubber tire gear. 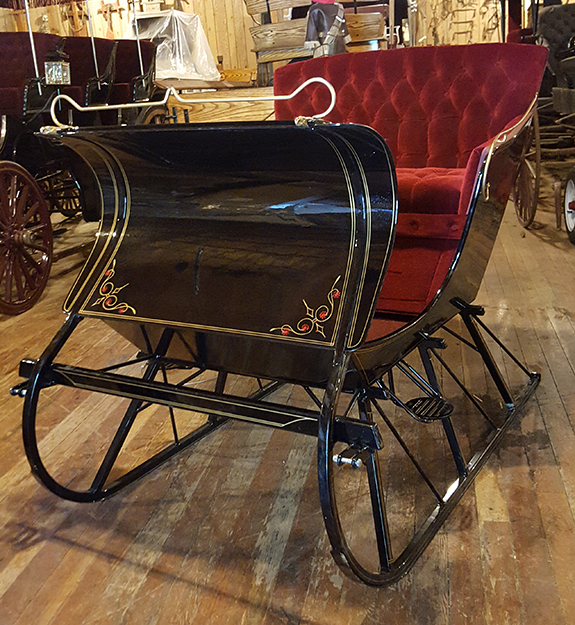 The Horse Drawn Miniature Buckboard comes with a hardwood-built body. 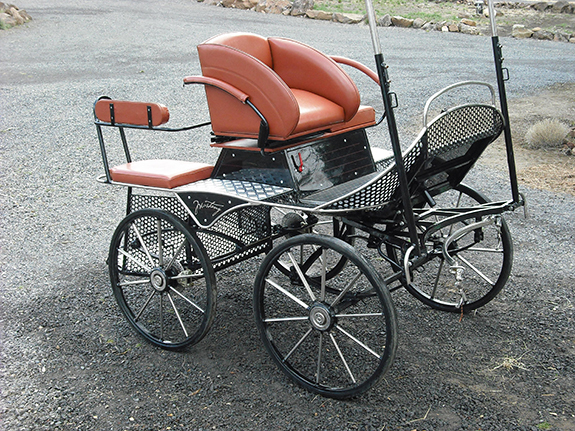 It can be built for any size miniature horse or pony. It can be made to hitch with a single pony shaves or team pole. 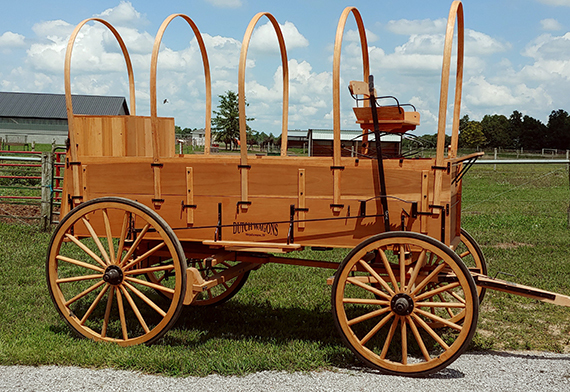 The wagon can be finished with a clear coat or stained and clear coated, in our new western finish or a paint of your choice. These carts can be shipped by UPS. $35.00 taken off price if you want to put cart together yourself. 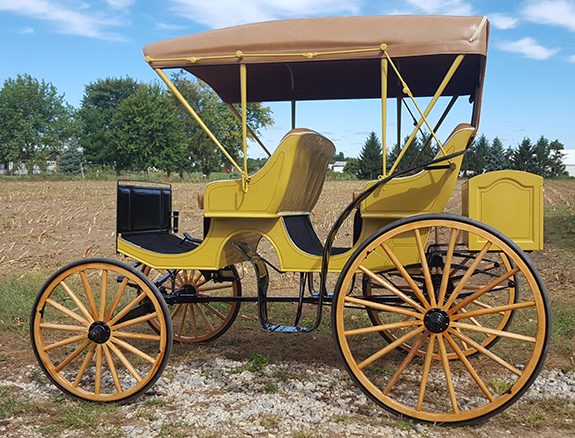 All Horse Drawn fore carts and wagon gears are powder coated, so not only will you have a quality product, but also one with a beautiful finish. 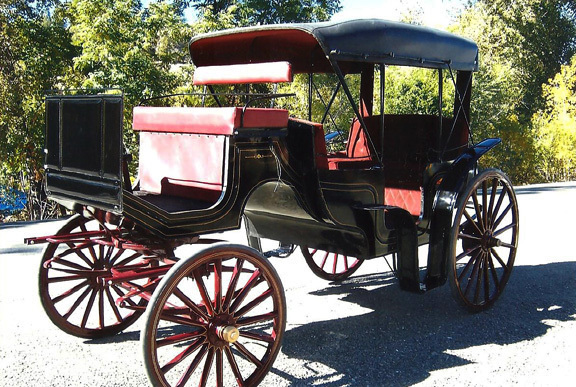 All Horse Drawn fore carts can be upgraded to include hydraulic brakes, fenders or bench seats. One or two piece shafts are also available. They come standard with a team pole. 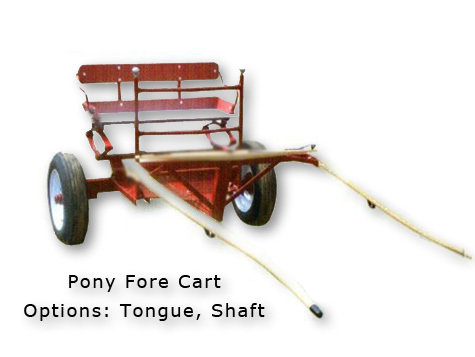 The following describes our standard horse size Horse Drawn Meadowbrook cart; draft horse and pony sizes are also available. Overall length: 11' 2" including shaves. Width: 5' 4" front fender top to ground. Wheels: 48" wood, channel and rubber. Seats: two separate but touching seats, upholstered in leather-like material with tuft and button design. Left seat lifts up for easy entry from rear, behind the wheel for safety. Body: Slatted floor of round edged boards, framed with hardwood, steel-reinforced, natural wood finish. Features: Wood dash, storage compartments on dash, storage trunk with brass trim under passenger seat. Brass rail. 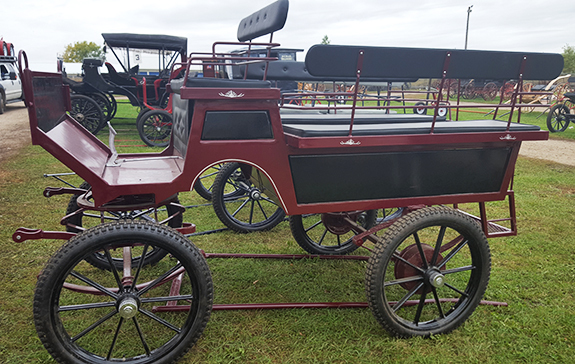 All Horse Drawn fore carts and wagon gears are powder coated, so not only will you have a quality product but also one with a beautiful finish. 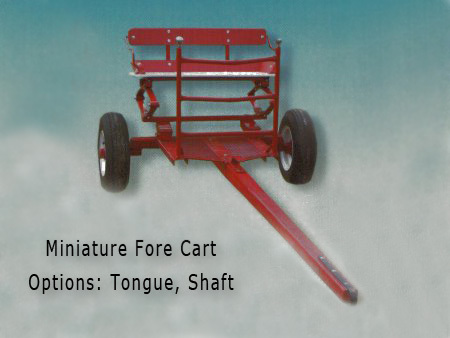 All fore carts can be upgraded to include hydraulic brakes, fenders or bench seats. All fore carts and wagon gears are powder coated, so not only will you have a quality product, but also one with a beautiful finish. 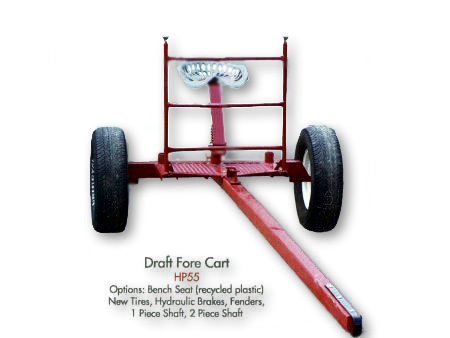 All fore carts can be upgraded to include hydraulic brakes, fenders or bench seats. One or two piece shafts are also available. Carts come standard with a team pole. All fore carts and wagon gears are powder coated, so not only will you have a quality product but also one with a beautiful finish. Contact us by phone, e-mail or fax for more information or to place an order. 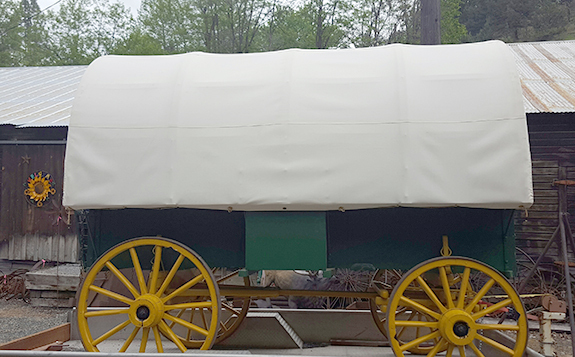 Copyright © 2005-2019 • Oxbow Wagons & Coaches and Oxbow Trade Co.